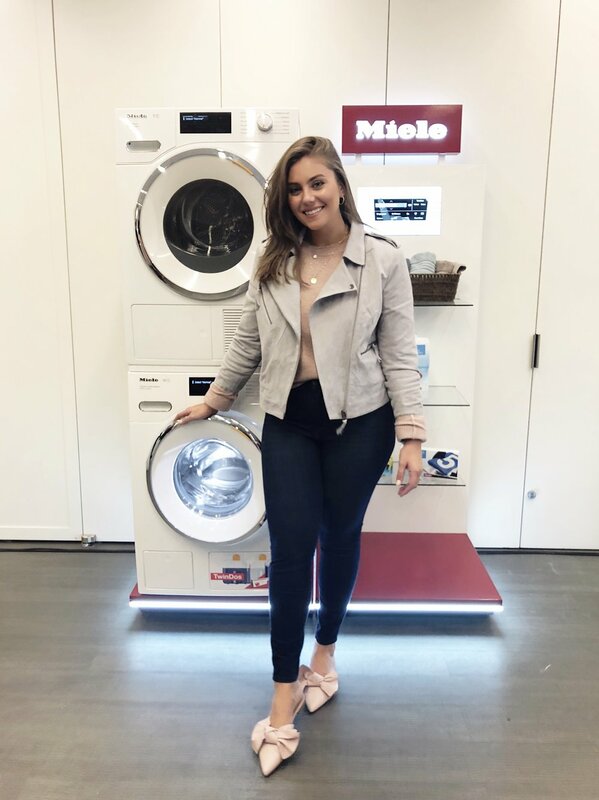 Last week in NYC, I had the chance to join Miele and Good Housekeeping to learn about the latest style trends and how to keep them looking their best. The night featured Miele’s new W1 Washing Machine and T1 Tumble Dryer. The evening began with cocktails, hors d’oeuvres and a panel hosted by Editor in Chief, Jane Francisco, Style Director, Lori Bergamotto and GH Institute Textiles Director, Carolyn Forte. We chatted all things fashion and laundry. My favorite takeaways from the panel were to invest in clothing that will wash well. It’s not the smartest investment to purchase a $20 top that will cost you $100+ in dry cleaning. The other discussion revolved around stains! Always do something, never just leave it and start by blotting the stain before adding any solutions to it. Miele is revolutionizing the standards of laundry with their brilliant and unique technology. The W1 Washing Machine features Miele’s exclusive TwinDos system. It is the first two-phase automatic liquid detergent dispensing system, which saves about 30% on detergent versus manually loading. This feature operates in two stages: UltraPhase1 and UltraPhase2. The first phase combats grease and soiling while the second phase removes difficult stains. We had the opportunity to witness this magic happen during a demonstration, the pictures don’t do it justice but it was magical! Miele has really perfected their process on stain removal. They showed the UltraPhase1 and UltraPhase2 in action. The washing machines also feature CapDos, a one-time use capsule that adds special detergents and conditioners that are formulated for different types of garments. They optimally dispense during the wash cycle which takes all of the guesswork out of washing. The W1 also features QuickIntenseWash, a superior quick load setting and SingleWash for lighter loads, which preserves water. 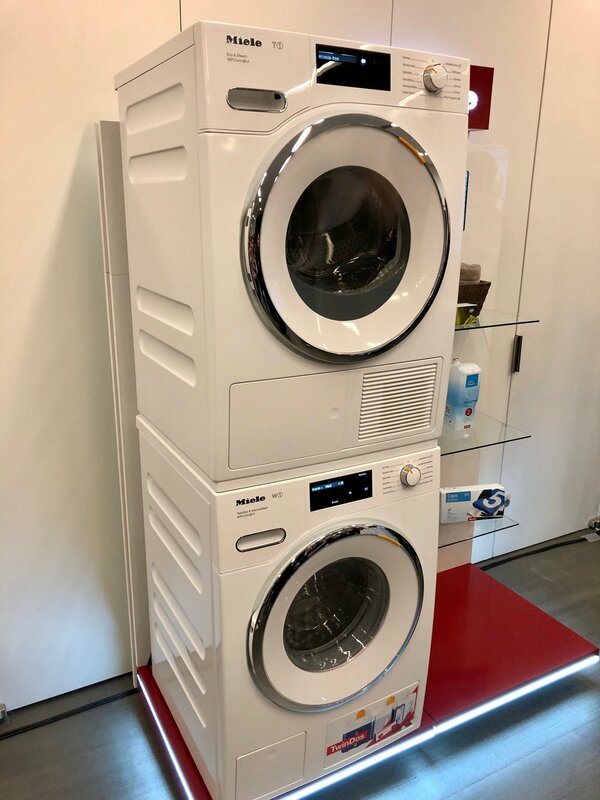 Let’s not forget about the T1 Dryer- it stands on its own with Heat Pump Technology, helping to reduce energy and operating costs with fast drying times. It also features PerfectDry, SteamFinish and FrangranceDos. Another fun feature about the W1 + T1 is that they’re both able to connect to WiFi, which allows the user to connect to the Miele mobile app. This allows you to monitor your laundry and your cycles- how cool is that?!? To learn more about these superior machines, visit Miele’s website here! Thank you to Miele and Good Housekeeping for partnering with me for this post. I will never view laundry the same way again!